As Chicago was buried with snow over the weekend, I decided to spend my time in my nice warm office, trying out some of the new-ish allied races, and seeing if all of the big huff about the leveling changes was warranted. 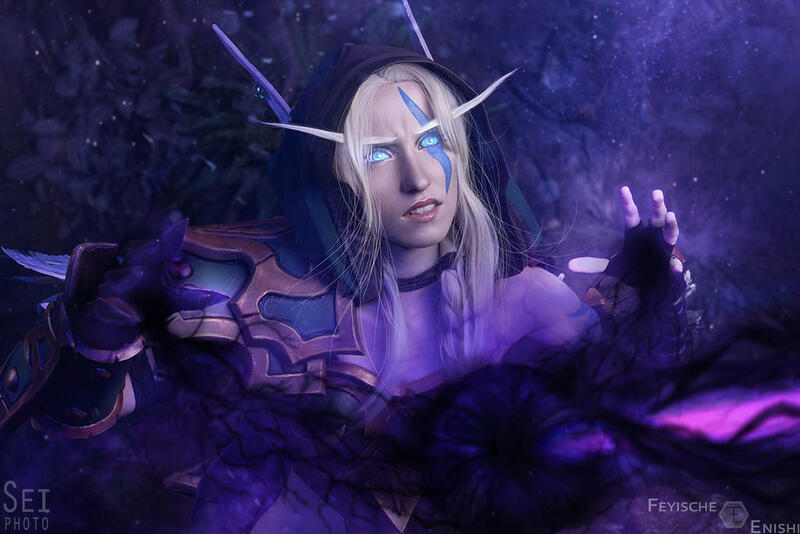 With hopes high, I rolled a new Void Elf Huntress, named Delliria (not the most creative, I know, but it just fit well). I'm not actually a big fan of alts. I've leveled, over the years, a handful of hunters, one druid, and this expansion, a demon hunter (which hardly counts as "leveling"). I've still got my instant 100 boost that came with Legion, and now I've got the 110 boost from BfAz. So it's probably not surprising that I haven't seen any of the lower level content in quite a while, and certainly haven't seen any of it in a world where specs are based on artifact abilities. Survival, much to my surprise, seems to be by far the strongest leveling spec we have now. I've yet to run into a normal mob that I couldn't one-shot with Flanking Strike (which wasn't supposed to be the case with the new changes to world leveling, I had thought). I've most missed having Terms of Engagement; SV would be by far the greatest leveling spec with that. Instead, you end up with a lot of time where you're fairly slow, and just tagging as many mobs as possible, individually, tossing your hatchet. It's also a bit late on the AoE, with Carve not appearing until level 42, though even without it, dungeons were a breeze. At low levels tanks do all the AoE damage, so you just kind of hang out and flanking strike until it's boss time, then you completely dominate. BM feels the most like classic Hunter leveling. It's a good bit slower than SV, as it doesn't have any one-shot type abilities. But pets are basically invincible, and even Dire Beasts can do some tanking at low levels. Given I named my character after a ranger, I had kind of thought I'd level as Marks; however, the spec is just worthless for leveling. It's as though everything is in slow motion, with all of the damage coming with long ramp-up times. I gave up on it fairly quickly. I'm no sort of leveling purest. I wore as many pieces of heirloom gear as I had, mailed myself a full collection of 30 slot bags, a few stacks of Goblin Gliders and a 5 or 6 stacks of drums (realized that the drums from MoP give you a stack of twenty when you craft one, and I still had all the mats sitting in my bank somewhere). Even so, questing was slow going. I think there are a couple problems that Blizzard may not have anticipated. Obviously it was intentional that they were trying to slow down leveling a bit in the way they changed HP vs experience gained. But what slows it down a lot more, is with the old system, when you were only doing a very limited number quests in each zone before out-leveling it, you just skipped all of the slow quests. There was no reason to do them. You'd just go to a zone and pick up every quest you could find, do the fastest ones while waiting for your dungeon queue, then by the time you got out of the dungeons, you'd have to move onto a new zone. Now, I have this feeling like I should 100% each zone, because it all scales up, so why bother moving onto a new zone? But then I end up wasting a great deal of time on the annoying quests (mostly gathering quests that don't give me XP while doing them). I think this is a lot of what's amplifying the sluggishness of leveling now. In the 30s, 40s and low 50s, I was getting about 1 level per dungeon, assuming it was the first time I'd done the dungeon so I was also doing and turning in the quests on each of them. I don't feel like that's much slower than dungeons leveling was before the changes? So i'm not sure what people are really complaining about there. They're also not noticeably more difficult, I don't think. To solo them as a hunter at level, you'd need to plan out your pulls, and it would take a while, but it's not really harder than it used to be. The tank is still at the mercy of whatever healer randomly queues with them, and the healer vice versa, but none of that really affected me. On my worst runs, when the tank was dying to moderate sized trash pulls, I still never died, even before I had feign death. I think part of that was because tanks are so AoE heavy early on, and at least BM and SV are very single target (BM has multi-shot, but no beast cleave). So when the tank dies, the adds spread out fairly evenly, rather than all going to on one player, even if that player was doing half the damage in the group. And really, bosses were dying so quickly that there was really no chance that the group could wipe on a boss. So yeah, no idea what the complaints about dungeons or dungeon leveling have been about. I was, as I mentioned, wearing heirloom gear. So if you were a new player in a group with all new players, it would be more difficult. But that doesn't seem to be any part of the audience that has been complaining about dungeons. I can't really guess what Blizzard is planning for the future of WoW. Perhaps they've given up investing in bringing in new players, and just want to continue as long as they can with the player base that's playing now, and those who used to play and come back briefly for each expansion for some nostalgia. However, I really think they need to make leveling primarily be part of the game for new players. The game was quite old when I started playing. It was during the last raid tier of Wrath, and I had no idea what I was doing, and no friends who played the game. I slowly worked my way from zone to zone, keyboard turning and clicking whatever random ability seemed like it might help. Perhaps I was playing the game "wrong", but I was having fun. If a mini-boss was too difficult, I'd go farm some XP on easier mobs, then go back and destroy that mini-boss, just like you would on any computer RPG. This is something that I'm worried about being taken out of the game. With the new leveling system, within a zone, there's no difficult area that you need to work your way to, and there's no easy part that you can feel powerful in. I imagine this might take more time than Blizzard is willing to put into old content, but I think the level scaling would have worked a lot better if they'd not scale everything to the same point. There should be areas in each zone where I'm scared to go when I first get there. Otherwise what's the point of leveling? The story, especially in the vanilla/cata leveling zones, just isn't compelling enough to keep me interested. If it's too complicated to design level scaling to make parts of each zone more difficult, then I think a reasonable solution would be the design of the Timeless Isle. It's a good model, I think, because it was made for all players of the same level, but it still had that feel that there were easy, safe areas, and then as you worked your way farther from the central area, you got to more and more difficult and dangerous mobs, until the extreme of the area up at the top where all the elite Youngols were. When the patch first came out, you needed a group (or to be a Hunter or DK) to farm up there. But by the time you worked your way through that last raid and got more powerful, pretty much anyone could go up there solo. This is more extreme than leveling zones should be, but there needs to be some of that power progression to get me interested. I want to accidentally walk into an area of the zone and just get demolished, so that I know I have something to look forward to being able to do when I get more powerful. So, I obviously haven't been updating this blog recently. With the Alpha coming out soon, perhaps I'll have more to say. And can get back to some real theorycrafting. With the state of the game at the moment, the stuff I'm good at hasn't really been all that useful. With the spec changes coming, however, I'm looking forward to getting my spreadsheets updated and putting them to use once more.